With the Lakers, Clippers, and Kings hosting a whopping 28 home games in 28 days from March 11 through April 7 — all happening at Staples Center, which is only a wind-aided Andy Lee punt from Grantland’s headquarters — we couldn’t resist attending these 28 games and writing about as many of them as possible. Click here for our coverage. When the first quarter ended Thursday night, with the Lakers up 12 and a lathered, playoff-type crowd on its feet at Staples Center, it felt like we were seeing what might undo the Oklahoma City Thunder come June. Through the first 12 minutes, Kevin Durant and Russell Westbrook were a combined 3-for-15. Andrew Bynum was handling Kendrick Perkins down low, and Kobe Bryant had nine points in what seemed like one of those nights where he would go off for 40. Everything argument for the Lakers as the chic new favorites in the Western Conference would be legitimized. The near-consensus in the Oklahoma City locker room after the game was that in previous years, the success of both the team and its young stars was predicated on their ability to score. When Durant or Westbrook struggled from the field, other areas of their game tended to struggle, too. Last night, the Thunder not only overcame that 12-point deficit, but throttled the Lakers in a 102-93 win that never seemed that close. There was evidence that a year later, and a year older, this team isn’t so easy to shake. After scoring 30 points in the first quarter, the Lakers managed just 38 in the next two quarters combined, and the team with the best offense in the NBA showed what it can do with a commitment to its defense. Coach Scott Brooks pointed to two main contributors on his team’s (usually) weaker end of the floor. The first was Thabo Sefolosha, who held Bryant to seven field goals on 25 attempts, and is showing that he is the type of long defender who can consistently bother Kobe if the two happen to meet in the playoffs. The other was more surprising, and for the Thunder, more encouraging. In his team’s last two high-profile contests, Durant has showed why he’s in the MVP discussion, and why he is more than the player who struggled against Dallas in last year’s playoffs. Against Miami, Durant facilitated much of the Thunder’s offense along with his own as he tallied eight assists to go along with his 28 points. Thursday night, he had 11 rebounds and a handful of defensive assignments that helped Oklahoma City shut down the Lakers offense in the second and third. Considering Westbrook’s second half, in which he followed his 3-of-10 performance in the first two quarters with an 8-of-13 stretch in which he looked unstoppable, it would be silly to pass all the credit to Oklahoma City’s defense. When Westbrook is playing like he was Thursday night — hitting jumpers, getting to the rim and the line, scoring at will — he was among the best players in the league and one of the reasons the Thunder think their chances for a title begin now. 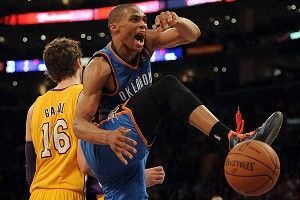 But those outbursts, even against the Lakers on the road, are expected. It wasn’t that Westbrook put up 36; it was that OKC stopped the bleeding for long enough for those 36 to matter. For the Lakers, Thursday night was another bump in an already rocky week. Despite the turmoil, L.A. came out looking every part the team that some believe can emerge from a bunched-up West. The problems arose when that first quarter ended. When the second units took the floor, it was recently departed Derek Fisher who provided the most offense for either team. After Kobe, Pau Gasol, and Bynum, the Lakers just do not have an option to create offense. Ramon Sessions looks like Derrick Rose when compared to Steve Blake, but when Westbrook is on the floor, it’s easy to remember why Sessions has played on four teams in six seasons. Sessions was barely a factor last night, and with Sefolosha checking Bryant and Perkins bothering Bynum down low, the Thunder looked to have Los Angeles figured out. Gasol’s disaster of a second half didn’t help. To go along with giving up two embarrassing offensive rebounds to Collison, Gasol managed to let Durant throw one down on his head and also added a couple of turnovers to the mix. In the fourth quarter, boos began to rain down. If the Lakers can iron out their in-house issues, they are as likely as anyone to meet the Thunder for a trip to the Western Conference Finals. But if Thursday night was any indication, there’s little doubt left that it’s Oklahoma City’s conference to lose.